This original symbloic combination draws from the connections between nature and the church made famous by St. Patrick himself. Taking his lead in associating the holy trinity with the 3 petals of a shamrock, the next artistic step seemed logical in weaving this expression of the trinity and the cross. 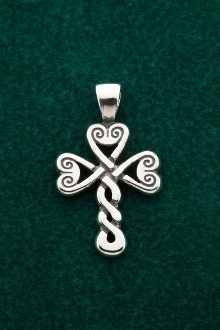 The result is a unique and feminine celtic style cross than the tradition more masculine high crosses.